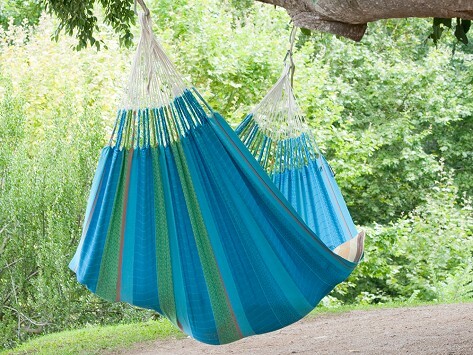 La Siesta hammocks are a vibrant blend of South American tradition and modern innovation. The Flora hammock has an extra-large surface of wonderfully soft organic cotton. The large number of suspension cords ensures optimal weight distribution, incredible comfort, as well as durability—and the cords are hand-plaited, too, to ensure quality. Dimensions: 71" x 157" x 102"
My husband has a new love! Sit in your La Siesta solo, or snuggle up with one of the kids. It’s a cozy bit of heritage that the entire family can enjoy.